The chronic pain epidemic has opened up many doors as to the way practitioners approach pain and how the multiple systems of our body are intimately connected. It has also made us realize that this metaphor of the mind-body connection is no longer just a metaphor. Nowhere is this more exquisitely expressed than in the connection between our gut and our brain, or what is called the gut-brain axis (GBA). Your brain and gut are connected by an extensive network of neurons and a highway of hormones that are constantly providing feedback as to how hungry you are, whether or not you’re experiencing stress, if you’ve ingested something that’s bad like bacteria or a microbe, and if you’re experiencing unpleasant sensations such as pain. Research suggests there exists a rich and dynamic relationship between your enteric nervous system, that’s the nervous system in your gut often referred to as your second brain, and your central nervous system. This innovative construct offers both practitioners and patients a window into understanding the mind-body connection, as well as further understanding how chronic pain develops and process. 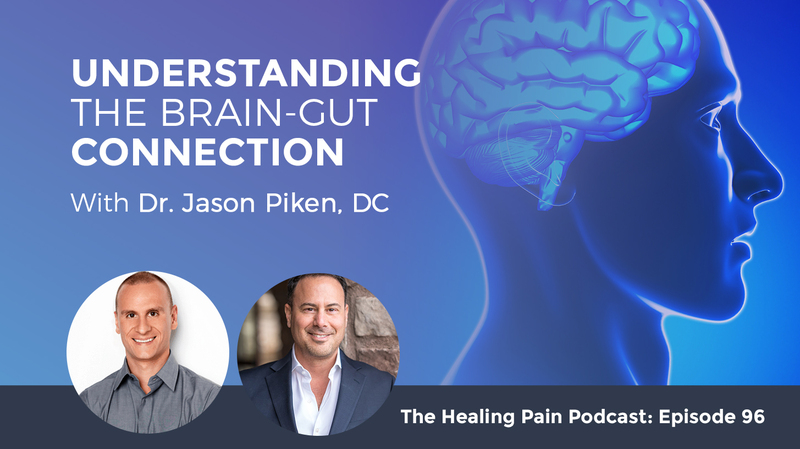 Chiropractic physician and certified nutrition specialist, Dr. Jason Piken, discusses food and nutrition as it relates to the gut-brain connection, as well as a few key nutritional supplements. We’re talking about how to manage pain through the gut-brain axis. The chronic pain epidemic has opened up many doors as to the way practitioners approach pain and how the multiple systems of our body are intimately connected. It has also made us realize that this metaphor of the mind-body connection is no longer just a metaphor. Nowhere is this more exquisitely expressed than in the connection between our gut and our brain. Your brain and gut are connected by an extensive network of neurons and a highway of hormones that are constantly providing feedback as to how hungry you are, whether or not you’re experiencing stress, if you’ve ingested something that’s bad like bacteria or a microbe, and if you’re experiencing unpleasant sensations such as pain. Research suggests there exists a rich and dynamic relationship between your Enteric Nervous System, that’s the nervous system in your gut often referred to as your second brain, and your Central Nervous System. This innovative construct offers both practitioners and patients a window into understanding the mind-body connection, as well as further understanding how chronic pain develops and process. Here to talk to us about the gut-brain connection is Dr. Jason Piken. Jason is a Chiropractic Physician and a Certified Nutrition Specialist whose expertise is in finding the correct line of food, lifestyle changes and nutritional support to help patients achieve their highest health goals. Dr. Piken has seen thousands of patients with digestive issues, chronic pain, anxiety and autoimmune conditions. We’ll discuss food and nutrition as it relates to the gut-brain connection, as well as a few key nutritional supplements. 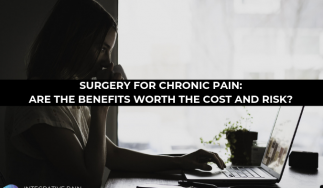 You may have noticed that food and nutritional supplements for pain are two topics that can cause a massive amount of confusion. To help you cut through the confusion and jumpstart your progress, I’ve created a cheat sheet to accompany this podcast. You can download it for free by going to www.DrJoeTatta.com/96download or if you’re on your smartphone, you can text the word 96Download to the number 44222. You’ll find some simple suggestions for nutritional pain management and a few simple supplement recommendations to help with your pain. Jason, welcome to the podcast. It’s great to have you here to talk about the Gut-Brain Axis. Tell us what the gut-brain axis is exactly. Every cell in the body communicates with the brain. One of the most important parts of the body that I find often ignored, is that connection between the gut and the brain and how important it is. Everybody that I meet is concerned about their brain health, Alzheimer’s and dementia are on the rise. People don’t understand that the health of their gut almost equals the health of their brain. I like to talk about it because the awareness is so low right now. There’s one particular nerve that’s important, the vagus nerve, which is a nerve that connects from the brainstem directly to the gut, to all the organs. There is a back and forth communication between the enteric nervous system, which is the separate nervous system of the gut and the brain. The vagus nerve is a big topic. I’ve talked to about it a little bit on the podcast with Stephen Porges, who’s a big researcher into Polyvagal Theory. Let’s talk first about how the brain affects the gut. Nothing happens in your body without the brain sending messages down. Our brain is important, it’s encased in bone, it needs to be highly protected. The brain is directing everything. The problems that I’ve seen in modern society, a lot of sympathetic dominance. The Sympathetic System means you’re awake, alert, you’re doing things, you’re getting your stuff done. If we are living in a state where our lives are driven sympathetically where our nervous system is highly active, it’s decreasing the function to our gut. If you’re eating while you’re in a sympathetic state, you’re not getting to digest your food properly. You can get away with it a lot more when you’re younger, but as we get older in that system keeps getting irritated more and more. We develop more and more issues of directing from our brain. The goal of the brain is to get it to calm down and relax. When I start talking about this, I can get excited on a podcast, but I can also tell myself that it’s time to just calm down, let things chill so I can digest the food that I have. In your practice, are you screening for things like anxiety and starting to talk to your patients who might have anxiety about this gut-brain axis? Every single person that walks in, I assume they have all three of the major stressors, physical, chemical, emotional stressors. Physical stressors on our body from the aches and pains of life. Emotional stressors that will leave us effectively in a more anxious way or downregulated more depressed way, it tends to be a lot more anxiety. The chemistry of the body, which can be anything from the gut to heart health to B-vitamin need. When we start talking about gut issues, a patient may first go see a gastroenterologist, they may be given some medications. What are some of the gut diagnoses that people come to you that are affecting their brain? The most common is irritable bowel syndrome, or acid reflux. Those are the diagnosed ones. Many people have heard through Internet searches about leaky gut, intestinal hyperpermeability. Many people have constipation or looser stool and they haven’t gone to a doctor about that because they almost think it’s normal. That’s their thing, they’ve had it their whole life, they think it’s okay to poop twice a week, or straining every single time they go. They’re unaware that their problems might not be coming from the gut itself, but it could be triggering downstream from the brain. If we had to flip that equation, how do we explain that to our patients? The gut makes people feel bad. There was an article in the Times making a cell phone analogy. There was a psych experiment where they had people that are teenagers and in their early twenties put their cell phone either in another room where they had no access to it and take a test. Another group of people, the phone was next to them, but they told them they couldn’t touch it. The people where the cell phone is in another room did much better on the test because they weren’t distracted at all. Even if you’re not checking messages because you’re in this study, you’re still thinking about your phone. I give this analogy when I talk to people about their little bloat or the fact that they had to run to the bathroom a couple of times or that they’re burping 50 times a day. Those little annoyances are a slight distraction and it starts to cause the brain to move in other directions. Always thinking about the problem rather than going on with your life. That’s one way. The gut makes people feel bad. Another way is strictly through Inflammation. I believe all symptoms that we have are our body just communicating with us that there’s something wrong. If all we do is try to cover up the symptoms, let’s say an acid reflux, by just taking a Pepcid or a Zantac or a Prilosec to get rid of the acid, we’re not trying to figure out why we had that problem in the first place, why our body gave us the symptom in the first place. We’re not allowing our brain to heal and we’re not allowing our gut to heal. We’re just feeling better, which is nice. We all want to feel better but we all want to find the root cause of the reason why we’re having the problems. When the patient’s coming to you, and they’re either coming to you with digestive problems or potentially chronic pain problems, what’s the number one intervention you’re going to first? As a practitioner of Applied Kinesiology, I rarely even know why people come to me when I first see them. I have my staff hide it from me unless somebody needs to talk. Let’s say 80% of the time at least, I analyze the person’s posture and see how they’re carrying themselves. A gut person might literally be cowered over a little bit of protecting their gut. What we do is Manual Muscle Testing where we test the function of various muscles in the body. Let’s say it’s a small intestine problem, very often I will find weakness in the function of their quadricep muscles. Somebody with bilateral knee pain, weakness in the quadriceps muscles, I’m going to ask them, “Do they have any intestinal issues?” Same thing with IT Bands, those are large intestine, pec clavicular muscles, they tend to relate to the function of the stomach. Often, when I’m analyzing a person without even knowing what the problem is, their body is telling me what is going on. Is it 100% accurate? Nothing is. Often there’s a good feedback mechanism from the body. Those now functioning muscles will be a source of pain for them. If your quadricep muscles aren’t firing correctly and you’re doing squats, I don’t care how many dead-lifts, squats, or leg presses you do, there’s going to be a glitch where your body can’t overcome the pain because it might be coming from the small intestine itself. Let’s say they have IBS, it’s obviously from their intestines, their stomach, organs. What is the connection between that and the quadriceps? How do you make that connection for the patient? Is it anatomical? Is it biochemical? The relationship tends to be through the acupuncture system. The small intestine line for the acupuncture system is connected to the quadricep muscles which is connected to the sacrum, which is connected to the intestines themselves or weaknesses in the motility of the intestines. That’s where the connection usually comes in. Are you treating the meridian itself or what are you treating? At times we do Meridian Therapy, I don’t want to call it acupuncture because I don’t use needles. I use a Teishin which is a spring-loaded device and Cold Laser Therapy over the acupuncture point. That is part of the treatment. We treat the muscle directly because if there’s a weakness even caused by the intestine, it’s still causing a problem in the quad. There might be fascial trigger points, muscle trigger points that need to be released in order to have an effect on the gut itself. Releasing the tension, the muscles helps the gut. Putting them on a leaky gut diet program could help also. You’re treating the meridian not necessarily with needles but with something that’s going to somehow affect the flow of energy in that meridian. You’re looking at it from a biomechanical perspective saying, “There’s still a weakness there, there is still tightness.” You’re going to treat that manually with exercise and then there’s a leaky gut protocol of some sort. Yes, sometimes supplements. I like to start with diet because diet is the key to everything. If somebody isn’t able to be perfect in their diet, I mean 30%, 40% of my patients travel all over the place and they’re going from place to place in New York City. If your diet can’t be perfect, sometimes supplements to heal the gut is what we need. What’s the number one diet recommendation that you begin with these types of patients? Number one is AI Paleo, Autoimmune Paleo. Everybody needs to do an elimination, reintroduction in order to figure out what’s best for them. AI Paleo tends to be a very restrictive plan, maybe more restrictive than a lot of people need, but it’s very simple rules-wise. I see a lot of gut patients that have SIBO, there is the Low FODMAP Diet, there’s the Biphasic Diet. There are tons of things that have these very specific fruits and vegetables you have to pay attention to. If they just started on AI Paleo and they can’t do that, then at least Paleo, they’re allowed to have some nuts and seeds. The rules are very simple in their mind. It might not be easy to do, but they don’t have to sit there with a piece of paper and study before they’re eating. AI Paleo tends to be a very restrictive plan, maybe more restrictive than a lot of people need, but it’s very simple rules-wise. How long do they follow an Autoimmune Paleo Protocol for in your practice? Depends on what’s going on with them. I’d say the minimum two weeks if I have somebody who’s resistant to change. I’ve got to see two weeks before they reintroduced. The average person, I say four weeks on stage one, which is that limited protocol. If you have years of chronic pain, if you have autoimmune issues that are debilitating, I’m going to say, “We need to stay at phase one for twelve weeks.” Mindset-wise, that’s hard. I’ve had one patient that waited a year dabbling into Paleo until he became so inflamed that he was finally committed. Once he jumped in, mindset-wise, it was easy for him, that’s what he said and he changed his whole life around. As far as supplements go, because you have a place being supportive, what’s part of your gut protocol? It’s hard to say that because I don’t have a protocol, I fix what I find. The most common things I use is some form of L-Glutamine, usually not straight, but in mixes. I like a mix called RepairVite from Apex. There’s RepairVite-GT which is higher inn L-Glutamine. L-Glutamine is a good powder source, that’s soothing and healing from the gut. Sometimes Aloe Licorice. Usually, there’s digestive enzymes like Similase from Integrative Therapeutics. I like it. It’s a broad-spectrum, inexpensive, and works with a lot of people. People, especially if they’re having problems with protein and fats, eat some hydrochloric acid replenishment until we find out how they can reproduce it themselves. Do you have a lot of patients coming to that have already tried elimination diets, Autoimmune Paleo diets? What is your approach with them if they’ve already somewhat tried the AIP approach? What I see online in some discussion groups, what I see in patients that have been to about fifteen other doctors and tried this and that, is they’ve always taken a single pronged approach. We spoke about at the beginning, everything is physical, chemical, and emotional. If you’re good with the chemistry, if you have an amazing time and you’re taking a lot of supplements, but you have physical stress on your body or you’re not sleeping well or you’re dealing with high stress at work, you’re not meditating, it could be a big hindrance into why you’re not getting better. My protocol is to fix what we find every single visit. There may be stress on emotional release or more stress on muscle work and telling them how to exercise and sometimes going back to chemistry. What we do with those complex patients is we hit them from a different angle. That usually is what funds their relief. Sometimes, I come across patients who have tried every diet. They know what the top seven to ten inflammatory foods and they never eat them, they’re taking glutamine and they’re on a gut healing protocol. The multivitamin, they’re taking Magnesium, they’re taking an extra D, they’re taking Omega-3 fatty acids, they’re taking every anti-inflammatory botanical under the sun and they’re saying to themselves, “How come I’m not better yet?” Patients are educated, they’re reading a blog post, and they’re putting themselves through certain things. They get there and they say, “Do I still have chronic inflammation or not?” It’s always interesting conversation to have because you can have chronic inflammation if your diet is not good. If your diet is okay, chances are that inflammation is not the cause. You start to look more toward the biomechanics or you start to look more toward mindfulness and emotional healing that people need. They’re tough conversations to have with people though, how do you enter into that? At times you find yourself pulling supplements out of people’s nutritional protocol. I had a woman bring me two binders, three-inch binders filled with all the supplements she was taking and she was still ill. I told her she was not allowed to take one thing. We started the conversation on emotions on her stress because it was incredibly obvious. I couldn’t believe that she’d been to twenty doctors. Maybe they did tell her and she didn’t listen, but it sounded like it was the first time that anybody ever spoke to her and had her relax. My biggest prescription was getting her to meditate for at least ten seconds, this is how high strung she was. Just 10 seconds at a time, six, seven times a day, just starting a simple breathing technique. Very often the realization that they don’t have to do all these other things. That there is a connection with their emotional lifestyle and their emotional health with the pain, creates an “a-ha,” which gives them the relief in and of itself. Then I find hands-on work, whether it’s chiropractic or physical therapy or massage or acupuncture or whatever it is, when you have a caring individual releasing stress from your body, it initially puts you into a parasympathetic state, which is more relaxing and more healing. People are just not being touched enough, they’re not given that message enough. Sometimes it’s a long journey, getting people to meditate for twenty minutes, twice a day. Sometimes people don’t get there, but they get better. That’s definitely a lot of supplements for someone to be taking. It was over 100 different supplements. Some of them she was taking what twice a day, powders every day. About 80% of her symptoms went away when she went off her supplements. The supplements, even though they are sold over the counter, you should have professional advice when you’re taking supplements. You have to have some guidance as to how to supplement a healthy whole foods diet that’s obviously right for you. Can we dip into neurotransmitters? When you’re looking at patients with chronic pain, what types of neurotransmitters are coming up on your radar that may need to be brought to someone’s attention whether it’s through nutritional supplementation or through stress relief? Number one is GABA. We work with some other neurotransmitters, sometimes dopamine, but basically the thing that most people, we’re trying to reach the masses, we need to find a way to stimulate more GABA. I rarely have people taking GABA. It’s a large molecule that doesn’t necessarily cross the blood brain barrier. It’s a test I do. I have people taking a 1000mg of GABA with nothing else in it, and see if they feel different. If you feel better, feel more relaxed, it’s sometimes a sign of a leaky brain, not just a leaky gut, but that permeability in the head is being compromised. Now you have an inexpensive support for your brain and we can also see when you stop getting the benefits of that GABA. It’s possibly a sign that the brain has healed or the brain barrier has healed, and you don’t have the leaky brain anymore. We need to find a way to stimulate more GABA. But the vast majority of the time, what I do is Precursors, anywhere from B vitamins to Magnesium to different amino acid blends. There are four different companies I use that all work on the relationship of shifting glutamate, which is an excitatory neurotransmitter, into GABA. Our body is supposed to do that on its own. It’s supposed to transform glutamate into GABA. Glutamate being scatterbrained, into GABA being James Taylor-relaxed. We should be able to do that at will and either through genetic short links or conditioning responses. We’ve lost the ability to convert that glutamate into GABA. We need some encouragement. I do love techniques like meditation and breathing techniques, but some people need that extra help. The supplements do help. I’ve seen some good recent results from CBD oil or hemp oil. That’s some great addition. To help with someone’s pain or to help with the production of GABA? Both. It’s the only thing I’ve found that works on both pathways. The CB1 and CB2 receptors in the body when stimulated can give antianxiety effects. They don’t trigger more anxiety like THC does, the whole plant. They calm the nervous system and they take away pain, they’re stimulating anti-inflammatory receptors. CBD is something that’s new. I spoke about it on one of my podcasts. Is there a certain milligram dosage that you’re finding works with patients as far as pain goes because CBD is new? It definitely does vary. There is no protocol. I did a lot of experimenting with a couple patients, a couple of friends, and myself and my family and I tried various brands. The most consistent because I was a water-soluble hemp oil. Some people have micellized the actual fat molecules, so they’ll suspend in a liquid. The biggest problem I saw with dosing is you could just take high doses of an oil, but you’re going to absorb it differently. Everybody’s going to absorb it differently. If you have a water-soluble, even though the dosing milligrams goes down from 100, which I’d be using in most people down to ten or fifteen or sixteen since it’s 80% to 90% absorbable, I can control it a little bit better. The goal is start low, see what happens. It tends to be water-soluble, fifteen milligrams to 30 milligrams a day is a nice sweet spot for pain. As far as sleeping antianxiety, ten milligrams to fifteen milligrams a day or at night before bed. You just start them off with maybe a couple of drops and then increase that every couple of days or a week? I start with the water-soluble with half of one droppers full, which doesn’t come up. It winds up being about seven milligrams to eight milligrams. That’s a nice place to start. We’ll see if there are any side effects. I haven’t really seen any. We’ve been using it in recent months. I will hit a side effect one day, but right now it’s a nice thing to experiment with as another tool. A patient’s open to experimenting with CBD oil? It’s legal. It’s fine. It comes from hemp, it doesn’t from marijuana. In other states where it is legal, I do know people are getting different doses with some THC that comes from the cannabis plant where the CBD is extracted and they leave a little bit of THC in there. From hemp, there is so minuscule amounts of THC, you don’t have to worry about that. The THC, which is the active ingredient that gives people the euphoric effect. They’re not getting high since there’s no THC in it. I had one person that claimed she felt a high and I can’t explain it. It could have been that she saw the label and she saw hemp and that was it. She gave it to her daughter and her daughter didn’t feel anything except that. It’s interesting though because I’ve been to a number of nutritional conferences and I’ve tried different types of CBD and hemp oils. If the THC content is not well regulated, it definitely gives me a little bit of anxiety and it gives other people symptoms of anxiety. It’ important that you get it from a good quality CBD producer who is keeping that THC level way, way, way low. That’s the part that can make people euphoric, it can also give people a little bit of anxiety or other types of some sensations, and unpleasant experiences. CBD is an interesting phenomenon that’s happening, especially for those with chronic pain, have you had success with the CBD oil on sleep? Yes, I would say it’s a no-brainer. I don’t use it on that many people only because of expense. If somebody doesn’t have a problem with the cost of it, it’s a great tool because it is something natural that has an effect on so many different systems. If somebody has a problem with sleep, which again affects healing and pain, I might move straight to Magnesium, Valerian, lemon balm, which are also helpful in sleep or GABA support. GABA agonists before I moved to CBD. It all depends on their mindset. 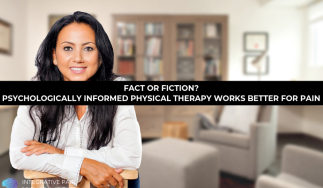 When someone comes to you, you’re looking at all different parts of lifestyle medicine, which is what the majority of people with chronic pain need as far as treatment goes. I have been speaking with Dr. Jason Piken. He is a chiropractic physician and a functional medicine physician in New York City. Jason, can you tell me where they can learn about you? The best thing is the website, DrJasonPiken.com. For your audience, I have the Leaky Gut Program sample to give them. It’s the whole program, PDF and a video I created that tells you how to use it. I want to thank Dr. Jason Piken for being with us on the podcast. Thank you all for being with us and we’ll see you next week on the next podcast. 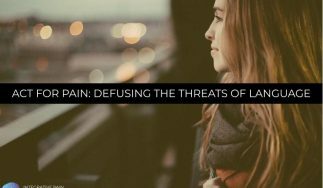 You can also subscribe to the Healing Pain Podcast where you’ll receive the new episode in your email inbox each week 100% free. Thank you all for being with us. Dr. Jason Piken is a Certified Nutrition Specialist specializing in the health of the whole person. His expertise is finding the correct blend of foods, lifestyle changes and nutritional support needed to help his patients to achieve their health goals. Dr. Piken has seen thousands of patients with digestive issues, chronic pain, anxiety, sugar metabolism and autoimmune conditions.